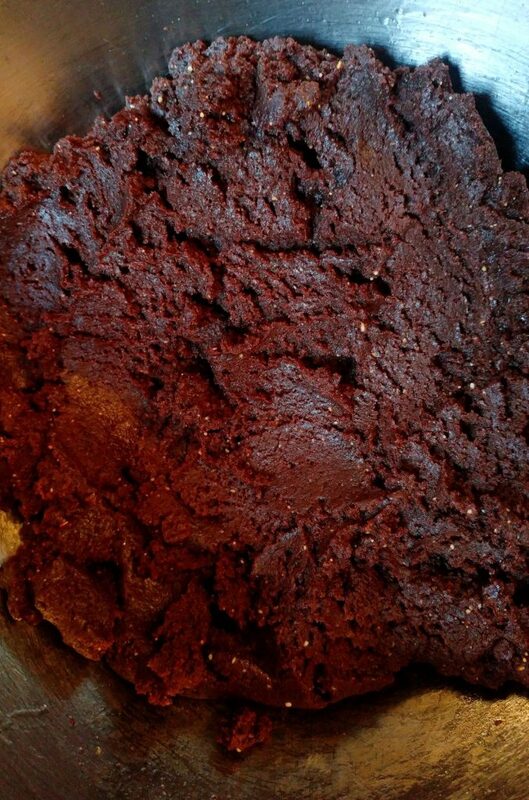 Next: Dark Chocolate Red Velvet Sandwich Cookies Recipe! Vegan! 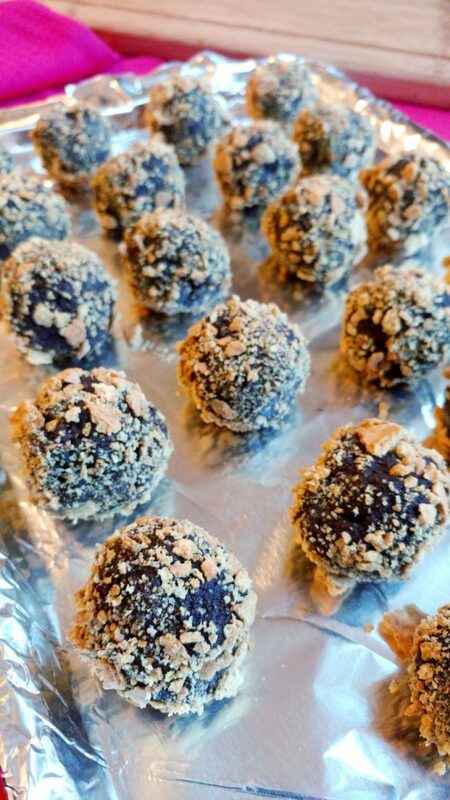 Does anything say love more than…CHOCOLATE BALLS?! Valentine’s Day is around the corner. The holiday of l-o-v-e. To me, it’s not just about romantic relationships. It’s a reminder to cherish & be thankful for all of the love in my life. All of the love in all of our lives. Love for family. Love for friends. Love for boyfriends, girlfriends, husbands, & wives. Love for our pets (PIPPA I LOVE YOU). Love for all of the people who make our lives full. and LOVE FOR YOURSELF TOO!! I’m a chocolate gal. Y’all know that. That is the edible way to my heart. It’s also the edible way that I like to spread love, and joy, and happiness, and deliciousness. SO, I teamed up with Cocomama to create chocolaty treats to celebrate LOVE. I bake from scratch 99% of the time. 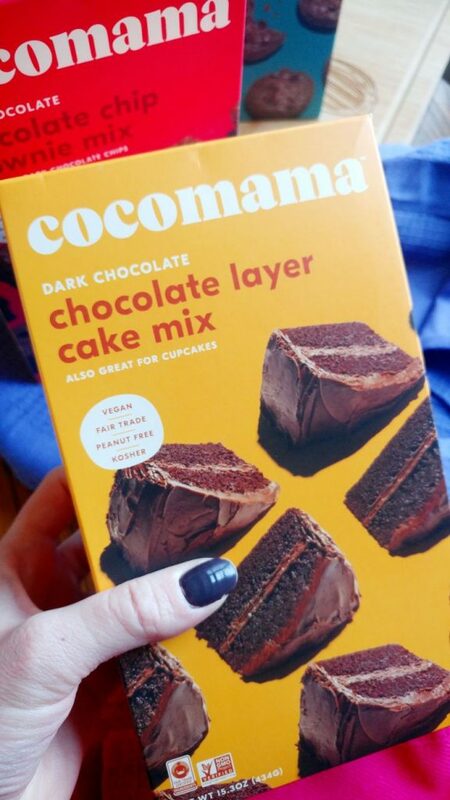 But when I heard about Cocomama’s baking mixes, I knew I had to give them a try. Oh my gosh. I am so glad I did! I’ve tried the Dark & Milk Chocolate Brownie Mix, the Chocolate Cake Mix, and the Dark Chocolate Cookie Mix. You would never know that these treats were made from a box!!! I do love homemade, but sometimes you just dont have the time!! And really, these are at least semi-homemade. You’re still baking them with love. In your home, in your oven. The mix just makes it SUPER QUICK!! All of us could use some time-saving, #amiright?! Fair Trade: All of the cocoa comes from a Fair Trade™ cooperative in the Dominican Republic—and is traceable from bean to brownie. Inclusiveness, diversity, and shared prosperity for everyone: Setting new standards for the food industry, cocomama is really trying to make this world and the food we eat BETTER! There are vegan baking mix options!!! As I thought about what to make in preparation for next week’s Love holiday, I thought of this episode in Hart of Dixie. Have you seen that show?! If you liked Gilmore Girls…you’ll like it. I LOVE IT and have watched the full series twice. Anyway, there is a scene where they conclude that sharing a piece of chocolate cake with someone is one of the romantic things you can do. With that, I had chocolate cake on my mind. But I didnt want to make a cake. It’s not as easy to share and distribute and eat (read: it requires, err, is recommended with silverware), and, well, I wanted something a little more out-of-the-box (no pun intended). Something fun. SO– I arrived at CAKE BALLS!! 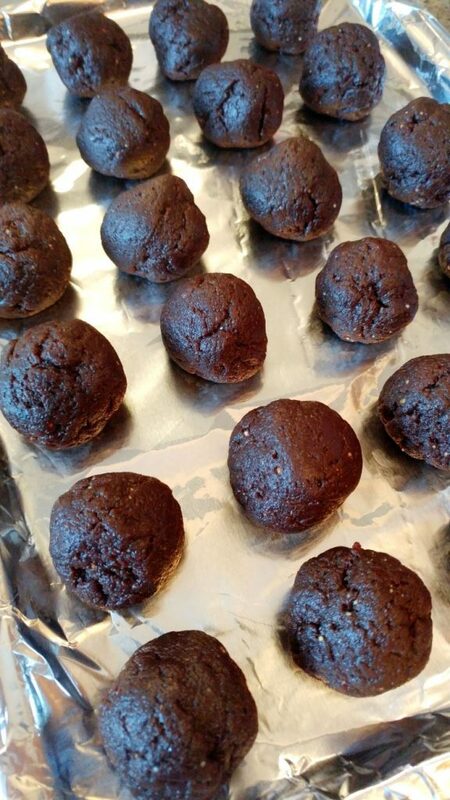 VEGAN cake balls! 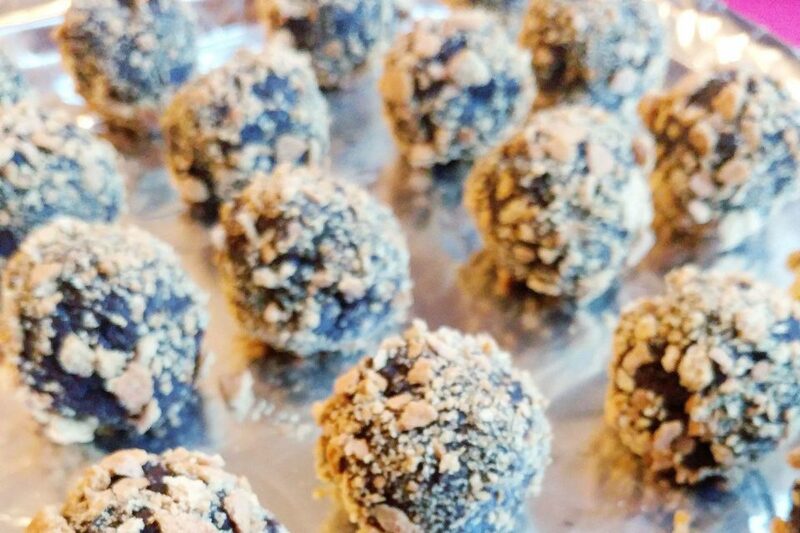 How can you elevate chocolate cake balls? ADD PEANUT BUTTER! Because chocolate and peanut butter is REAL.TRUE.LOVE.  See– the mix is Vegan & Fair Trade!!! How awesome is that?! Even if you aren’t Vegan. It doesn’t matter, the cake is fully amazing, just also Vegan-friendly. The directions on the box use eggs and milk though, so we’re going to prep a different way to stick with the Vegan. I am ready to put some cake balls in my mouth. Are you? Let’s get ’em started!! 2) Prep your flax eggs. With a fork, mix together 3 Tablespoons of flaxseeds with 9 Tablespoons of water. (1 flax egg is equivalent to 1 Tablespoons of flaxseeds and 3 Tablespoons of water, and we’re making 3.) Allow this to sit for about 10 minutes. 3) Line a 13×9 inch baking pan with foil. Spray the foil with non-stick cooking spray. Set this aside. 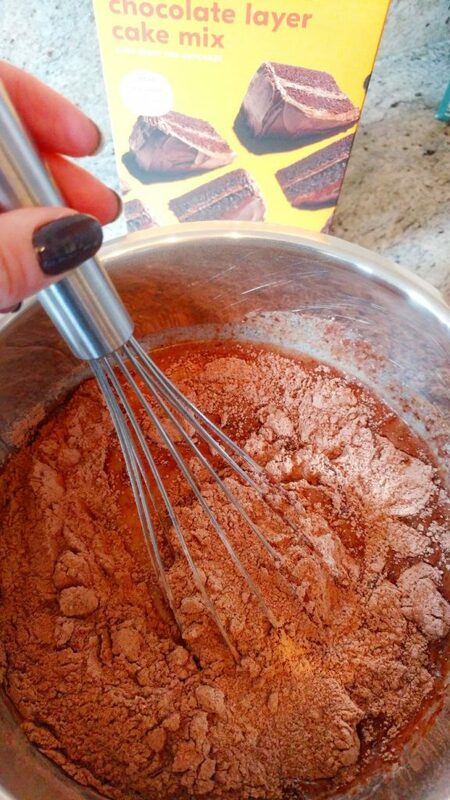 4) In a large bowl, dump out your cocomama baking mix. Add in the melted coconut oil, almond milk, and flaxeggs mixture. 6) Spread the batter into your prepared pan. Bake the pan in the oven for about 25 minutes. If you lightly press your finger on the top of the cake, it should spring back. And/or, a toothpick inserted near the center of the cake should come out clean. That is how you know the cake is done. 7) While the cake cools, wash your bowl! You can use the same bowl again for the next step! 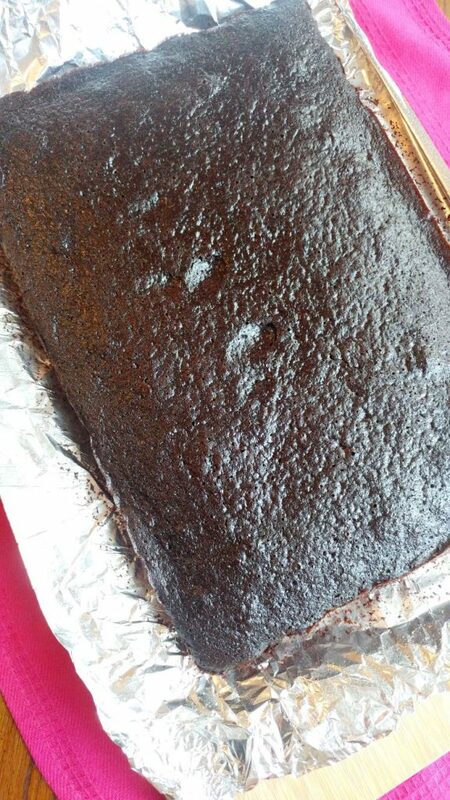 8) Once the cake is cooled, cut it into squares. Or really, any shape! 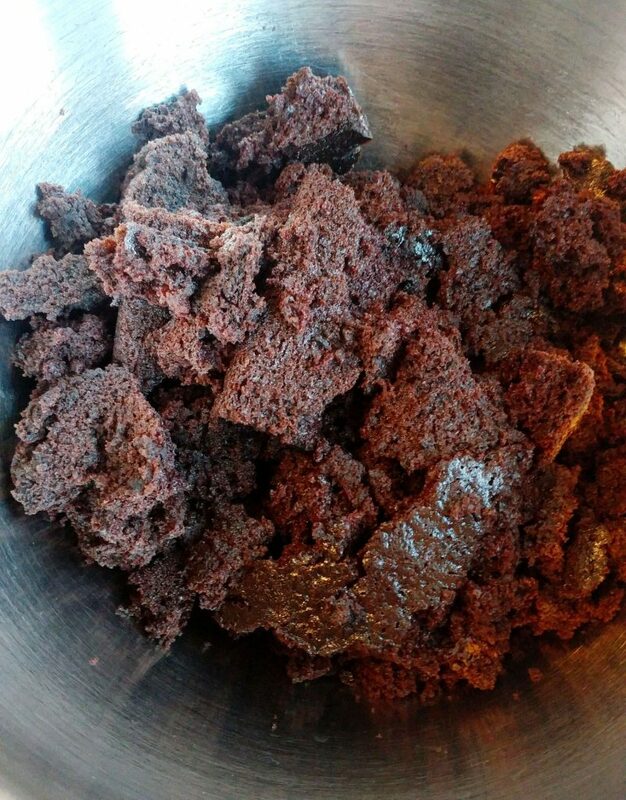 You just want to be able to break up the cake into pieces that can go into your now-clean bowl. Baked cake, now in a bowl! 10) Line a cookie sheet or jelly roll pan with wax paper or foil. 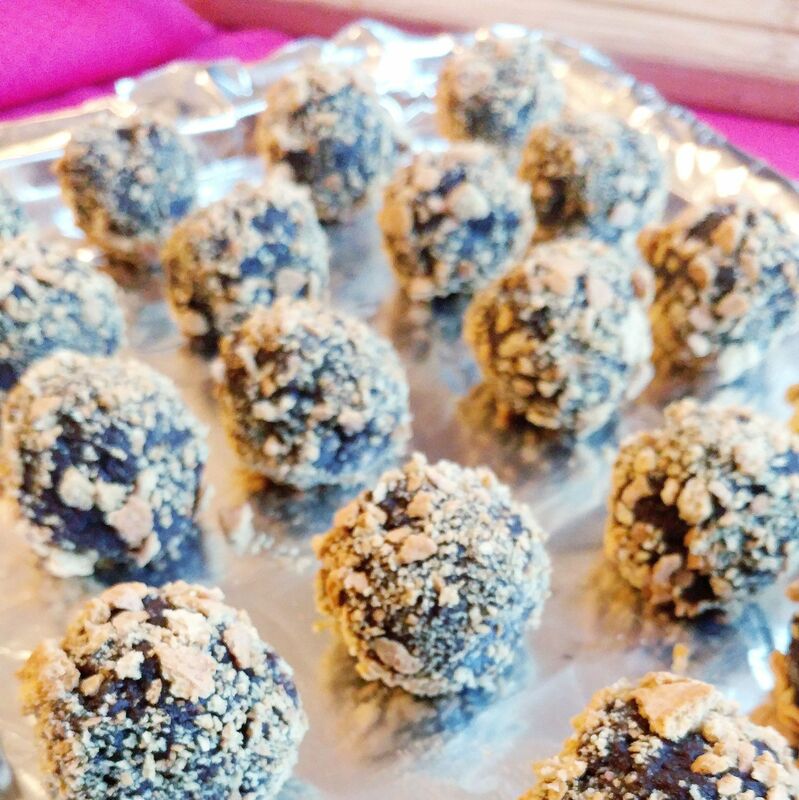 Using your hands, roll the cake ball dough into about 1 inch balls (or whatever size you want)! 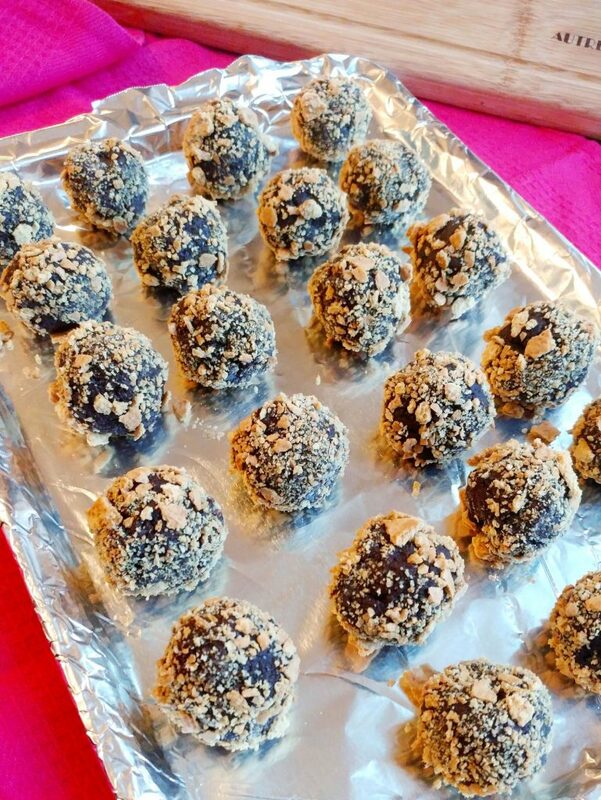 Fill up the cookie sheet with balls. 11) Chill the balls in the freezer for about an hour. 12) After about an hour, take the cookie sheet out of the freezer. Roll the balls in the graham cracker crumbs. 13) Place the cake balls back in the freezer for about another hour or until you’re ready to serve/eat them! Store them in freezer-safe counter in the freezer. 14) If you want, package them up into cute little baggies and give to all of the people you LOVE! For Valentine’s Day & for Galentine’s Day!! If you have some extra ones, just keep them in your freezer. Whenever a chocolate craving strikes, grab a ball and pop it in your mouth! A portion-controlled, small chocolate treat that has BIG flavor and chocolaty satisfaction. It’s a win-win for all! Who will you bake these for?! ?